In choosing to participate in peaceful protest actions you can often come face to face with police. Here are some tools to assist you – firstly, with understanding your legal rights when participating in actions, but also some tips in dealing with police, as well as minimising the information you share with them if they happen to want to keep an eye on you. In recent years, the government has consistently de-funded the excellent work of community legal centres and Environmental Defenders Offices, and so it is often left to community legal activists to do the work of supporting activists with resources. Be aware that some information on external websites listed may be out of date, or only relevant to various state jurisdictions. Please ensure you double check or get legal advice before relying on any information linked below. Another project we launched in 2018 is our CLIMATE JUSTICE LEGALS NETWORK to support environmentalists and connect lawyers with activists, and mentor community collectives who are providing citizen legal education. MORE HERE. Environmental Defenders Office – find your local EDO and fact sheets for your state here. Please be aware that most EDO’s across the country are unable to help with criminal law and protest matters at this time, but it might still be worth checking in. 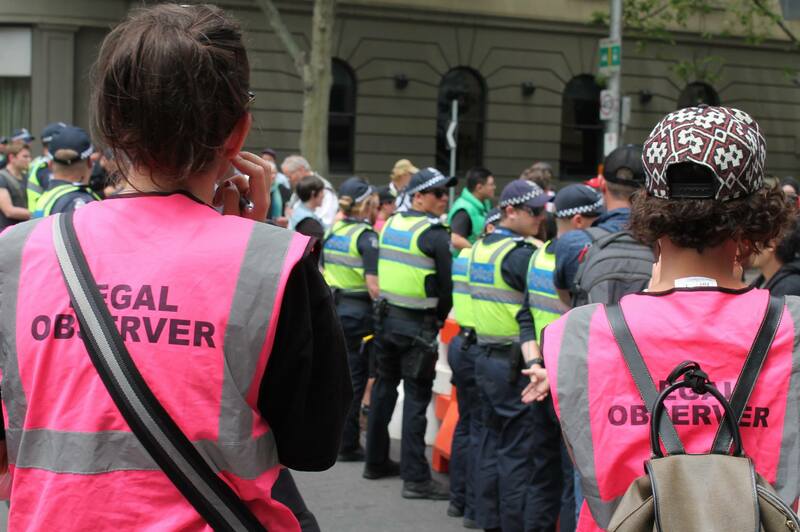 Melbourne Activist Legal Support – a network of volunteer lawyers and legal activists we are involved with who provide legal support, training and field human rights observers to protest events. A recent overview (2017) of a growing legal resource compilation. This legal guide for beeliar activists Jan 2017 was prepared by a lawyer and activists for the campaign to defend the Beeliar wetlands, but includes much general information for activists in peaceful protest. There is limited activist related legal documentation in other states (Northern Territory, South Australia and Tasmania), but you can check the Law Handbook for each state, as well as Legal Aid. We will be working on adapting our face sheets for these jurisdictions in 2019 – if you’d like to support with this project, get in touch! FEDERAL – there have been recent changes to federal law that may impact activists that we hope to bring forward resources for. COURT PROCESS – here is our guide to Considerations for the Court process – Dec 2016 update. We also have a resource to come regarding crowdfunding for civil disobedience fines, and in the meantime you can find some helpful reflections here.